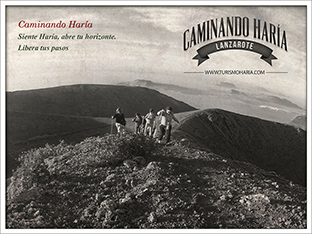 Hike number 2 – Stroll in Haría. 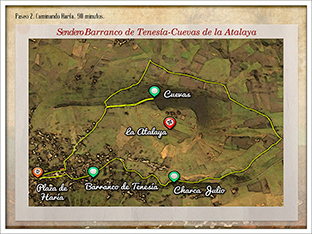 The itinerary goes down through the Tenesía precipice and around the base of the Atalaya volcano, which we will access by a slightly upward slope before reaching Máguez. Then we’ll go through the carved caves before returning to the village. The Tenesía precipice is part of the village. One could say it lives below Haría. The visitor perceives its presence through the existence of wide canals that appear and disappear in the streets, seemingly without continuity. We enter the precipice through an alley with a picturesque well, home of overflowing but imperceptible life, that hides us among stone walls, palm trees and cultivation terraces. Further, there is a pond from which leaves an irrigation canal which then leads to a lake, in-between high natural stone walls covered with lichen. Leaving the Precipice, we will walk a stretch of road towards Máguez. During this trip, the abrupt volcanic landscape around us is the result of several rounds of eruptions, combined with the peaceful and tidy aspect of the traditional cultures. From there, one can enjoy the majestic Corona volcano, essential icon of non-historical eruptions, that arises from the Macizo de Famara itself, thus giving birth to the extraordinary Malpaís of Corona. 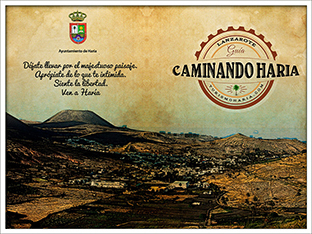 The Malpaís then heads East and extends to the sea to form the Verdes cave tunnels as well as the Jameos del Agua. The ascent is done by the Atalaya mountainside up to the carved caves, from which we can observe the villages of Máguez, Arrieta, Punta Mujeres and Mala.